Virtual Private Networking (VPN) enables device connecting private networks or servers over internet/public networks. Layer Two Tunneling Protocol (L2TP)/IP Security Protocol (IPSec) and Point-to-Point Tunneling Protocol (PPTP) provide communications services and networking capabilities available in WinCE. By default in Toardex WinCE Image does not include catalog item for establishing VPN communication services(L2TP/IPsec or PPTP). Platform builder(WinCE 6.0 or WEC 7.0 depends which image you are working on). Toradex WinCE platform builder Workspace and BSP. Note: We have not tested VPN on CE5.0, WEC2013 but it should work same way. Add above mentioned item in catalog Item View, then run Sysgen command in visual studio 2008(Build -> Advance Build Command ->Sysgen(blddemo -q). It will take some time depending upon your PC speed. After Build succeeded, update your image with created image. Navigate to Control Panel->Network and Dial-up Connections -> Make new Connection. Now VPN communication features should be available. Configure VPN according to your server PSK(pre-shared key), server IP, username and password. 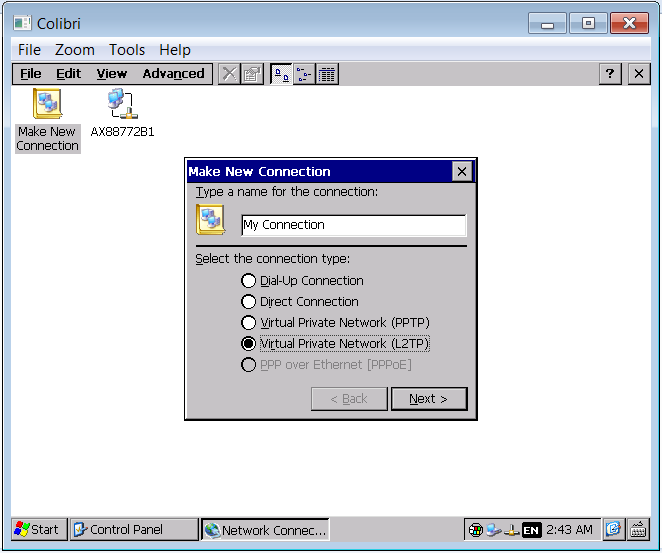 A new connection will be available in Network and Dial-up Connections for VPN connection. Visit http://www.vpngate.net and select a VPN server with L2TP/IPsec support. Warning: At the time of reviewing this article (2018-05-15) the test server listed below did not accept the connection anymore. Visit https://freevpn.me/accounts/ and choose a server. VPN catalog item is part of core license so you don't need to buy any additional WinCE license. Above mention credential can be changed by service provider. In case you have any questions/feedback, please send us an email at support@toradex.com.